Car manufacturers have implemented daytime running lights onto their vehicles as an additional safety feature. One vehicle in particular is the second generation Lexus IS that comes equipped with daytime running lights that also share the same bulb size as the high beams. The 9005 amber halogen is not very appealing at all. 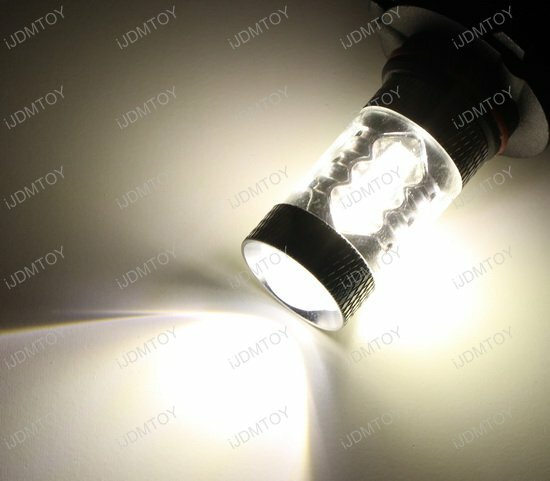 How do you convert the amber to a white color? 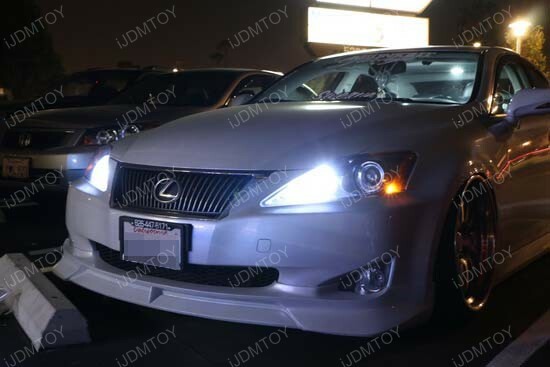 iJDMTOY’s Lexus IS250 9005 LED DRL kit for the Lexus IS will allow you to convert from amber to white. The second generation Lexus IS has become a popular vehicle since it was introduced in 2006. The popularity has grown over the years because the aggressive sporty body style and comfort. This entry level sedan has won over the young age group. We have received a lot of interests regarding the daytime running lights which is why we have tested countless hours to get the LED daytime running light kit to work properly on the Lexus IS. I, myself, own a second generation Lexus IS as well. I was very skeptical initially on converting the high beam and daytime running lights from amber to white. The whole process sounded like a daunting task. 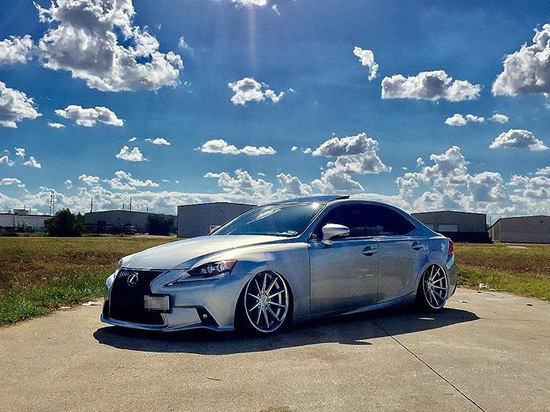 After reviewing the iJDMTOY Lexus IS Lexus IS250 9005 LED DRL Kit, every component included was a simple plug and play which made the installation extremely simple. I mean who doesn’t want a plug and play installation? It just makes everyone’s life a lot easier. The daytime running lights are a standard feature on the Lexus IS with the intention of providing additional safety on the road during the day. Since the Lexus IS shares the daytime running light bulb as the high beam, it cannot take a LED on its own. In daytime running light mode, the factory module operates the bulb at 6V approximately 30% power and LEDs require 12V to operate. 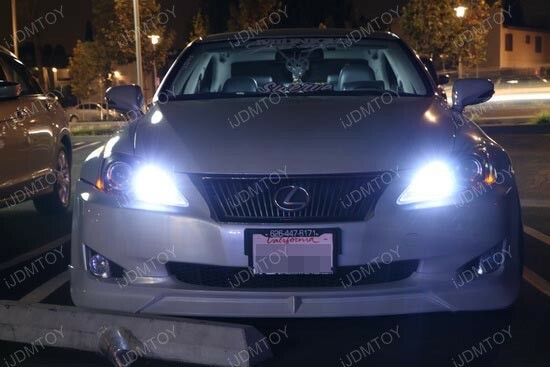 The Lexus IS250 9005 LED DRL kit includes two 9005 LED bulbs and 2 DRL Decoders to prevent any flickering issues once installed. The LED bulbs connect to the decoders and the decoders connect to your factory harness. It truly is as easy as it sounds. 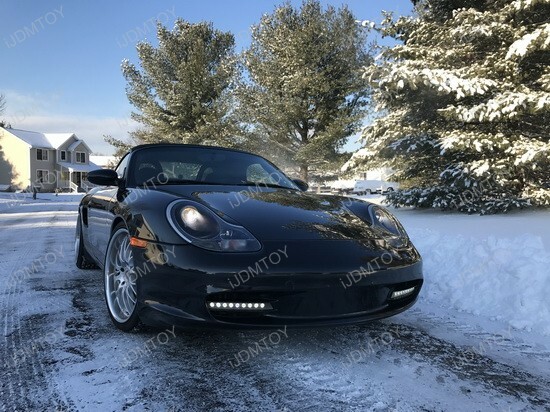 Once you replaced the 55W factory halogen bulbs and turned on the car, you will notice a significant difference the LED bulbs gives appearance wise. Once the decoders are installed, you can confirm there is no flickering by standing afar in front of the vehicle. Changing out the amber color in your daytime running light would definitely make your car stand out from the crowd. Many people are accustomed to seeing amber for daytime running lights. Also, many do not believe it is possible to change it out to a white color. 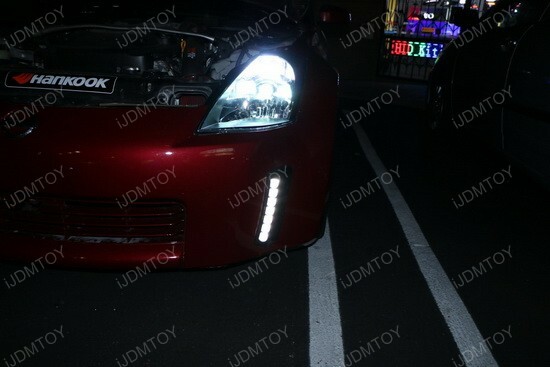 The LED DRL kit is recommended to any car enthusiast or anyone who loves their vehicle. It is time to take initiate and get rid of that dull amber colored light! 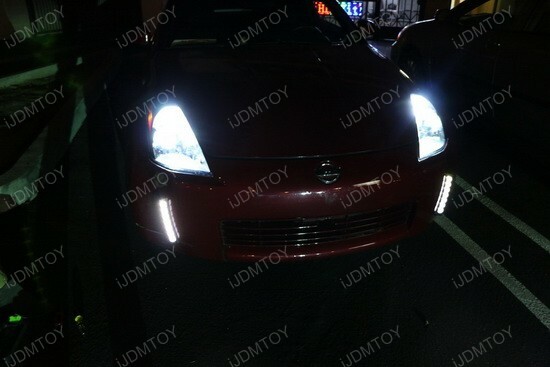 Want your Nissan 350Z looks like the new 2013+ 370Z with a stylish vertical front bumper reflector LED daytime running lamp? This is what you must have. Not only the LED daytime running lights improve the safety alerting the pedestrians, but also make your car looks more stylish and more eyes catching on the road. Since the 2003-2005 Nissan 350Z are not equipped with daytime running lights, we have a new LED daytime running light that would be a direct replacement on the front reflectors of the 350Z. Why keep the reflector when you can go with a LED daytime running light kit that bolts directly on. The level of difficulty of the installation will vary depending on automotive experience since it does involve some basic wiring knowledge. Some basic wiring includes locating a ground and a 12V power source to turn the LEDs on. In addition to basic wiring knowledge, you will need to be able to locate and remove the factory reflector off the front bumper. 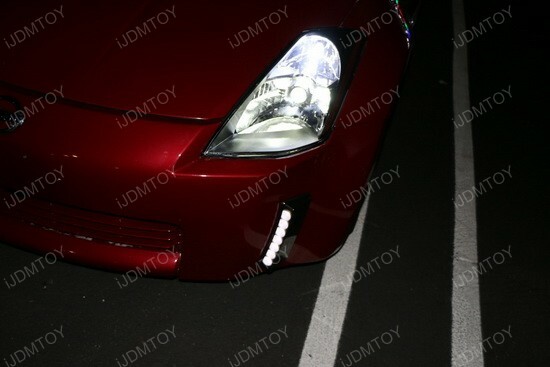 The Nissan 350Z Front Bumper Reflector DRL LED is a great upgrade to the front end by bringing life back into the vehicle. 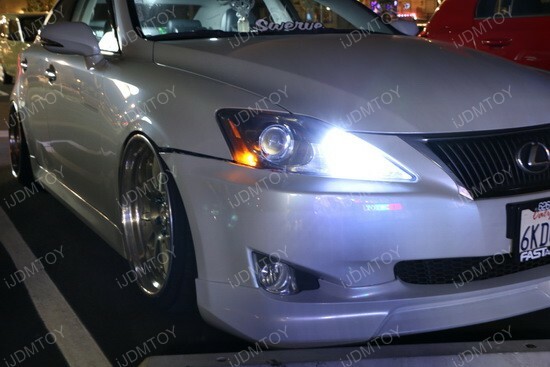 The Front Bumper Reflector DRL LED is equipped with 7 High Power LEDs in a 6000K color temperature. There are two available finishes in either smoked or clear housing. 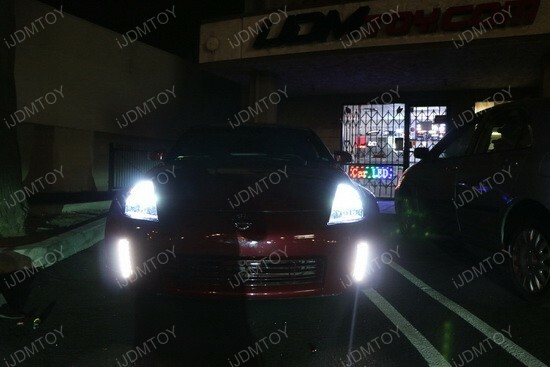 There is an additional feature on this DRL LED which enables the Nissan 350Z to dim the DRL LED once the headlights are turned on. 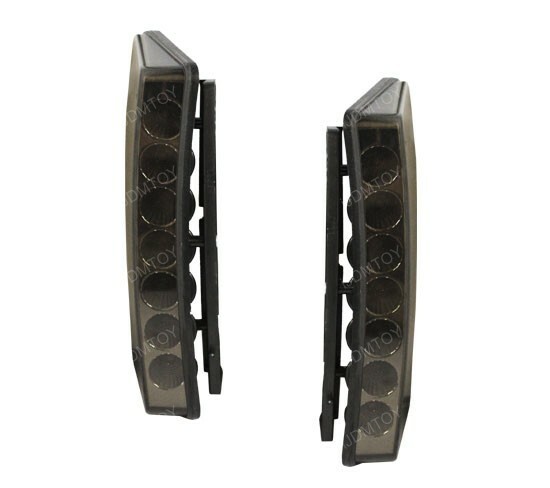 To conclude this front bumper reflector DRL LED kit, it is a great aesthetic modification for the vehicle that provides additional light output for safety and a stylish modern appearance. Since this kit is a direct replacement, it does not require any additional modifications to fit or operate. Why keep the reflectors when there is a great alternative available for the Nissan 350Z?